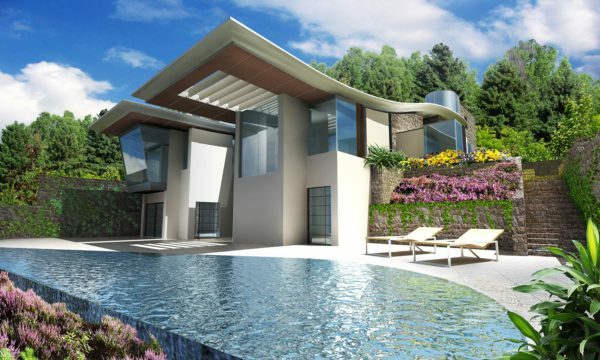 This one-off house on a rocky promontory in Jersey has recently obtained a Planning Permit. The site has now been cleared ready for construction. The house, steps down the site, and makes use of an existing driveway. A small bedroom, which forms a lookout tower, responds to a 19th century tradition and to the idea of maritime landmarks. This extraordinary site, wild and windswept, falls precipitously down towards the rocky coastline. The house at Wolf’s Caves invites a particular kind of architectural response. The house is entered on a cross axis and creates a double height hallway in the centre. The internal circulation is a sequence of staircases over which a continuous rooflight will give a sense of an internal landscape following the topography of the landscape outside. 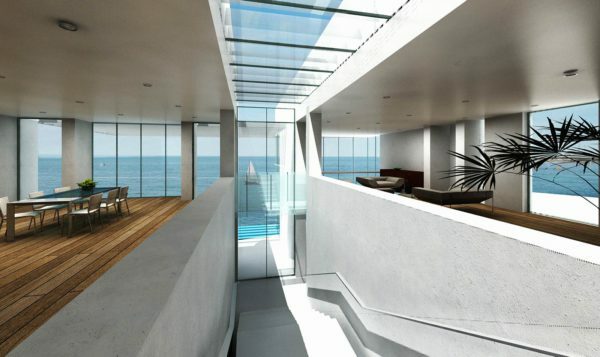 The layout ensures that all rooms gain east or west sun and reconciles minimum exposure to the north with a strong orientation towards the sea. This is amplified by the long views through the living areas and the cantilevered roofs which reduce glare. The cantilever beyond the dining room consists of a series of reflectors which direct sunlight down to the pool and terrace below. The new house is located at the very edge of an escarpment defined by a reflective pool … beyond which only the sea and sky are visible. 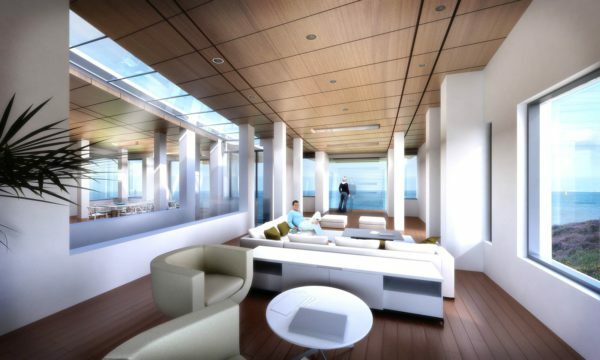 The living areas, living room and dining room face north for a marine prospect. The long flanks of the house, which contain the kitchen and the library, a breakfast room and study respectively, face east and west. The lower level contains a gym, family room, utility room and cellars below ground level. The top lit circulation spine becomes a bridge across the three storey high entrance hall with a castle- like stair climbing up the outside of the prospect tower to access the highest bedroom.